Cinnamon is the oldest Spices of the world and comes from Ceylon. In the olden Days Cinnamon was not only used as a spices but also a medication against cough and heart problems. 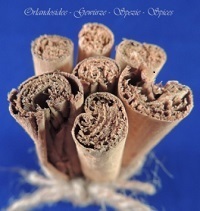 Even today the most aromatic Cinnamon comes from. In the modern Kitchen Cinnamon is used to prepare fruit desserts as well as meat dishes.